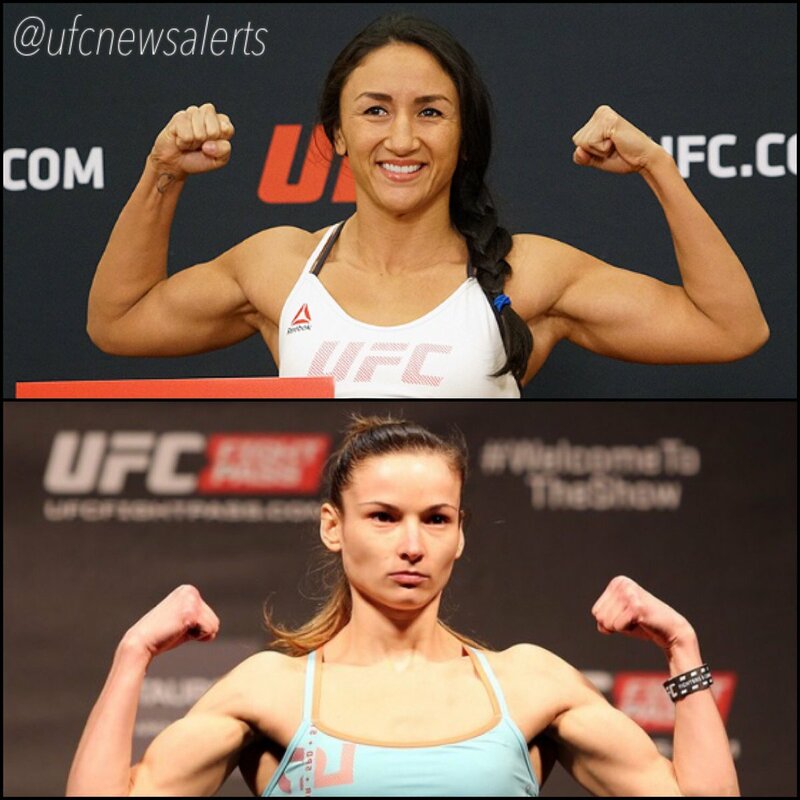 Brett Okamoto of ESPN reported last night that Carla Esparza vs Maryna Moroz has been added to UFC Fight Night 112 June 25 at the Chesapeake Energy Arena in Oklahoma City. This will air on Fox Sports 1 in the US and TSN in Canada. Of course Carla is a former UFC Strawweight Champion who seems to be on a downward spiral. She wants to stop that with a win. Carla is a four time all American wrestler. Her record is 11-4 and she trains at Team Oyama in Irvine, CA. She lost her last fight in February by split decision to Randa Markos. It's a fight Carla should have won but I think she underestimated Randa. Afterwards, she complained about the decision. But the ref missed an illegal knee and that would have been grounds for a successful appeal if Randa had lost the decision. I scored the fight a draw because of the foul. It doesn't matter because a close fight doesn't help her get back in the title picture. So now Carla needs a dominant win more than ever. A loss could put her on a one way trip to Palookaville. Maryna is from the Ukraine but she trains with her boxer husband in Moscow. She looked like she was headed places when she submitted Joanne Calderwood in her UFC debut. But when she laid an egg losing to Valerie Letourneau, many of us wondered if she was the same fighter. A big win would have got her a title shot. Since then she is 2-0 against mediocre competition. In August, she beat late replacement Danielle Taylor by split decision. Both fighters stunk out the joint and Maryna and her husband admitted afterwards that Maryna used her height advantage to keep Danielle at a distance. So she deliberately stunk out the joint to squeak out a win. Then she was supposed to fight Jessica Andrade for a title shot in Dec. but Maryna backed out due to injury. Jessica went on to beat Angela Hill for that title shot. If Maryna can get a dominant win, it gets her into the title picture. There are other fighters going after that next title shot so I don't think a close fight helps either fighter. Maybe being on the same card as her BFF Felice Herrig will inspire Carla. It could be very interesting.